Amish quilt blocks historically started out as one solid color, whole cloth designs. For many Amish, quilting for decor was viewed as useless because it didn't serve a purpose. Not until quilting began to lose favor with other Pennsylvanian cultures in the 1800's did the Amish begin to make quilting their own. Whole cloth designs were painstakingly quilted with intricate designs over the whole quilt. Stitches had to be even, and designs equal because of their large scale. As most traditions evolve so did the one of quilting. By the late 1800's the Amish whole cloth design evolved into Amish quilt blocks, which were simple variations of squares and rectangles. These geometric shapes of bright, solid fabrics were then arranged in particular patterns. Although these designs started in the corners and borders, these early Amish women never repeated patterned blocks over an entire quilt. Instead they chose to use a medallion type design in the center of their quilts. The Center Square, Bars, and Diamond in the Square designs were most popular. As time would have it more complicated Amish quilt patterns grew out of these geometric designs. One such design is the Sunshine and Shadow Amish block designed in 1935. 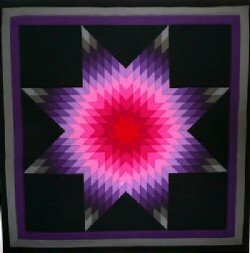 Many blocks of color contrasting light and dark radiate out from the center of this quilt. With its wide borders and detailed hand quilting this soon became a period piece. These designs contrasted against a wide dark colored border, create an impressive look. In most Amish communities Amish quilt blocks are always cut from solid colored fabric. In Lancaster Amish communities some use a print fabric but only for the back of the quilt. 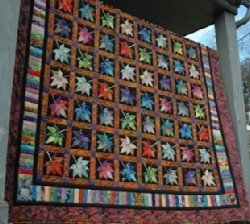 Some more quilts would include designs such as the Amish Tulip Quilt, Amish Grape Basket, and Amish Star. In making quilts though, the Amish quilt itself is really secondary to its colors. Early Pennsylvania Amish chose colors that reflected their way of life, simple and practical. Conservative colors such as deep and somber reds, blues, browns, greens and blacks, typical of those used in their clothes. 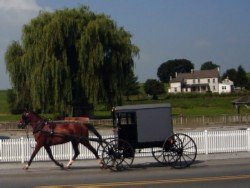 Those Amish who migrated away from the Pennsylvania area actually used bright colors such as yellows and whites. Initially quilts were given for wedding dowries or as esteemed gifts. But in the 70's Amish quilts became a must-have item due to the popularity of geometric designs in then current art trends. Because of this sudden interest it wasn't long before the Amish began to make their quilts specifically for sale. In order to attract buyers the women began using updated colors and more modern patterns. Because of the need for "faster" work a lot of women started using treadle sewing machines powered by a foot pump to piece their quilts. Hand quilting is traditionally put every 2 inches to keep the batting from shifting. Although this is no longer required with the new types of batting available, the Amish are reluctant to change. Amish girls begin learning this intricate skill as young teenagers. Usually by the time they are sixteen they have honed their craft. Expert quilters will consistently quilt 10 stitches per inch. Amish quilts started as an expression of frugality, something useful only to keep one's family warm. Now these beautiful pieces of art are filled with character and history. Recreating Amish quilt blocks can only be successful if stitched with patience and love.